Tabbouleh or Tabouleh, is probably the most famous salad that hails from the Levant Region (Bilad Al-Sham بلاد الشام) which includes modern day Jordan, Lebanon, Syria, Palestine and Southern Turkey. Originating in the mountains of Lebanon centuries ago, Tabbouleh has become one of the most popular dishes in the Middle East and no collection of Middle Eastern recipes is complete without it. In fact, Tabbouleh's popularity has exceeded far beyond our region and various variations of it are made all over the globe. In Armenian cuisine Eetch is a very similar salad as is Kisir in Turkish cuisine. The basic two ingredients in Tabbouleh are parsley and fine bulgur. Bulgur is a whole grain cereal food made from wheat that is a common food ingredient in Middle Eastern and Mediterranean dishes. It is a very healthy and nutritional addition to the dish. 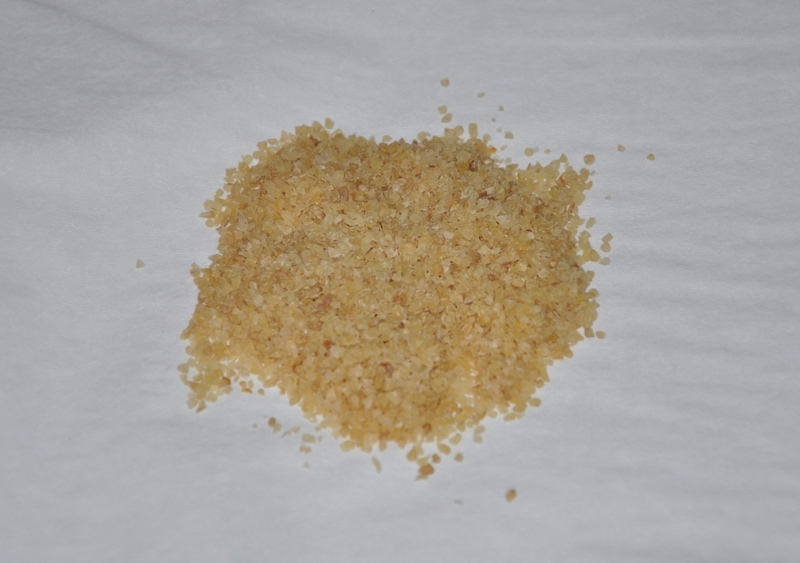 There are different types of bulgur; fine, medium and coarse. the type mandates how long and in how much liquid the bulgur has to be soaked before cooking. The fine variety is usually used for Tabouleh although some recipes use medium bulgur. The original Lebanese Tabbouleh recipe calls for a little less bulgur than I use in my version, but I found that my girls enjoy it better with more bulgur as it reduces the overpowering taste of parsley. No matter how prepared, Tabbouleh remains one of my favorite dishes! 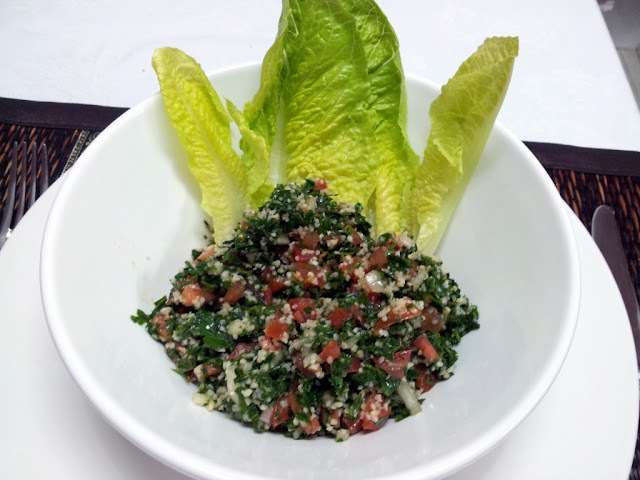 Tabbouleh is served as a Mazze on top of romaine lettuce. The listed portion for Tabbouleh Salad below will serve 8 people. Wash the parsley and mint well by soaking it for 10 minutes in a mixture of water and salad disinfection tablet. Rinse well. Put the bulgur in a bowl. Mix 1/4 cup of the lemon juice with the 1/4 cup of water and pour it over the bulgur. Set aside for the bulgur to soak in the moisture and soften. Remove all the parsley and mint stems and discard them; you only need the leaves for this salad. This step is the most time consuming and could raise your preparation time considerably to more than the 30 minutes that I try to limit my dishes to. But luckily, in many supermarkets these days you can buy the parley and mint cleaned from the stems! Hurray! The following step is to cut the parley; I use the large food processor with the heavy-duty blade for this. Place about 1 1/2 cup parsley in the processor and use the pulse option for cutting. We put the parsley in small batches and use the pulse option to ensure that the parsley isn't chopped very finely as that will make the parsley taste in the salad overpowering ). On average you want the leaves to be chopped down to the size of corn flakes cereal. Once, chopped remove from the processor and place the second 1 1/2 cup of parsley; repeat the process until you finish the whole parsley. Repeat with the mint. Finley dice the onions (if you are using spring onions, also chop the green part). Mix the black pepper, allspice and only 3/4 teaspoon of the salt with the diced onion and set aside. 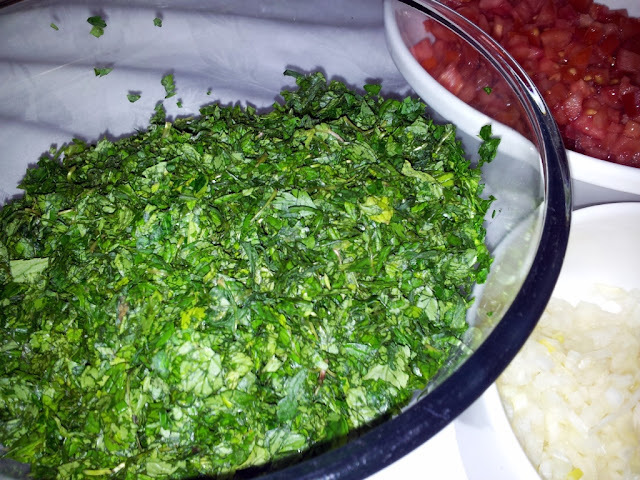 By now, you have prepared all the ingredients for the tabbouleh salad. You can do all these steps a few hours ahead of time and store the ingredients separately in the fridge, but don't mix them together until just before serving; you don't want a soaking tabbouleh! 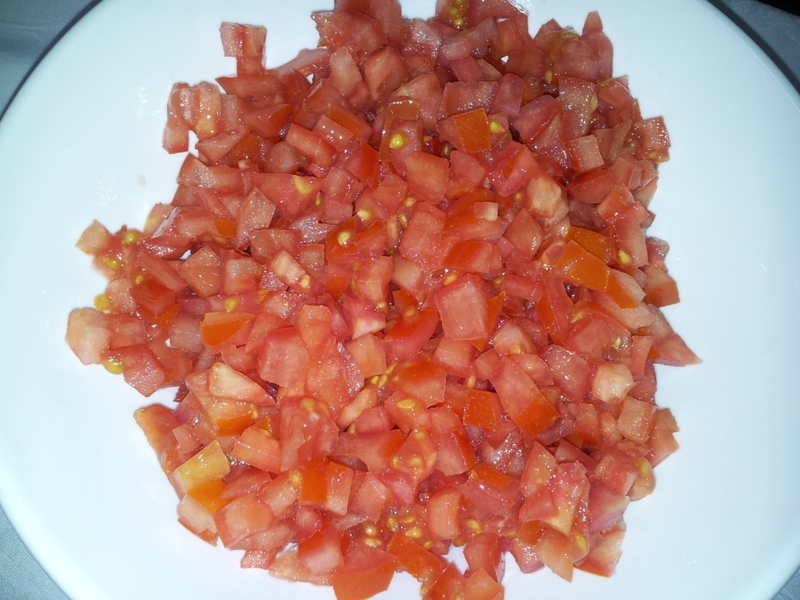 Before serving, mix the prepared parsley, onions, tomatoes and bulgur. Prepare the dressing by: mixing in a cup the remaining 1/4 cup of fresh lemon with the remaining 1 teaspoon salt and the olive oil. Why mix the ingredients first, check this? Salt is a personal taste matter, so you will have to determine the exact amount that suits your taste and adjust accordingly. Pour the dressing over the tabouleh salad and mix well. 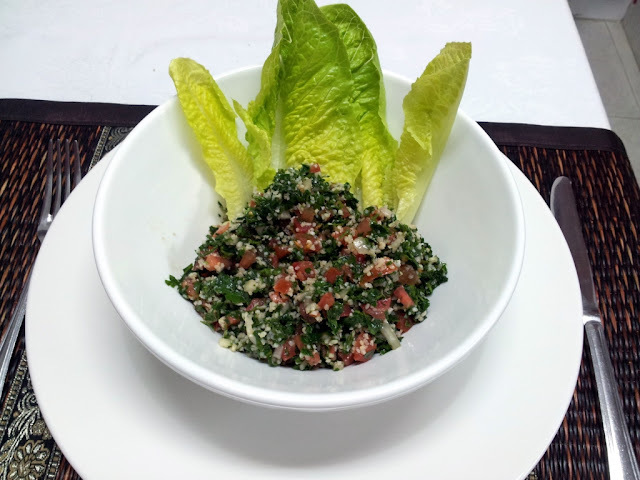 Once you arranged the tabbouleh salad in the serving dish, garnish the sides with the romaine lettuce leaves. Hope you enjoyed today's easy salad recipe: Tabbouleh Salad. Bon appetite. What is your favorite Middle Eastern Salad? I just saw your post thru linked in and delighted to come across your blog. I do Turkish cooking and recipes at my blog www.ozlemsturkishtable.com, and I have a bulgur salad similar to Tabuleh, though more bulgur in it. So enjoyed your post! Setta: Wow! I still recall with fondness eating fantastic food at your house with yoyr family. Congrats on your great website and recipes. Good for you! Yummy food! I love the way your have displayed your recipes with the step by step picture approach, so now I will try them and I'm confident that they will be great. You might want to consider publishing your own cookbook.